Zombie Joe’s Underground Theatre Group proudly presents their All-New 2017 Holiday-Horror-Theater Spectacular in the great Grand Guignol, Theatre of Cruelty and Butoh-Traditions, centering around the traumatic memoirs of a forgotten street-alley haunted by the longing, beauty and unspeakable yule-tide events of its cold, diabolical past; a cursed place of no mercy, inhabited by a hundred-year accumulation of apparitions, phantasms and seductive-sub-breeds that desperately await their next victim! 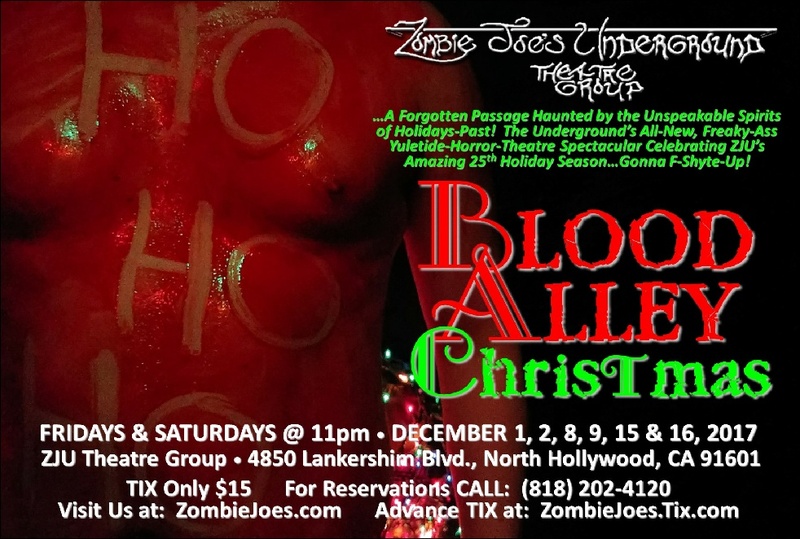 Directed by Zombie Joe and Featuring: Patrick Beckstead, Jason Britt, Vanessa Cate, Michelle Danyn, Shayne Eastin, Ian Heath, Makoa Kawabata, Amanda McKenna, Elif Savas, Brandon Slezak and Matthew Vorce; Live Musical Score by Kevin Van Cott; For Ages 16 and up. FRIDAYS and SATURDAYS @ 11:00pm, DECEMBER 1, 2, 8, 9, 15 & 16, 2017.